Nintendo's pre-production of the game, according to Nintendo was that 2D version of BoTW that they created. That was done in 2012 and development started on botw in 2013. It was showcased 17 months later in it's first trailer, but the lighting engine was done for wind waker hd and other elements of the engine and game were borrowed from previous works. It's all in the GDC developers talk that he did in 2017. You just proved my point. Pre-production started in 2012, almost immediately after SS shipped (and yes I did watch that same GDC talk - that’s the one where they mention that they couldn’t feasible have made another traditional style 3D Zelda game in HD, due to the extreme development time and cost that would’ve been involved). It was roughly 5 years development in total (6 if you count the DLC production), with roughly 4 years of actual production. If they started development in 2018, I wouldn’t expect a new 3D Zelda to be finished until around 2023. That’s too long of a wait; therefore there is a place for a smaller scale Zelda game for Switch in the interim, along the lines of ALBW. You just proved my point. Pre-production started in 2012, almost immediately after SS shipped (and yes I did watch that same GDC talk - that’s where they mention that they couldn’t feasible have made another traditional style 3D Zelda game in HD, due to the extreme development time and cost that would be involved). If they started development in 2018, I wouldn’t expect a new 3D Zelda to be finished until around 2023. That’s too long a wait; therefore there is a place for a smaller scale Zelda game for Switch in the interim, along the lines of ALBW. Surely that will depend on whether they iterate on BotW (think Majora's Mask) or throw everything out and start fresh with a new approach? They will have started work on a new Zelda title after BotW shipped (possibly on a small scale alongside finishing work on BotW DLC) so could be 18 months or so into it already, and if they are looking at something like the BotW equivalent of Ocarina>>>Majora then it's possible you'd be looking at a dev cycle of something more like 2+ years, rather than 4+. I'd be very surprised if they abandoned the BotW work immediately, given how long they iterated on the Ocarina formula and tech, and I suspect a BotW-style Zelda with more hand-crafted content would be received positively. Mario and Tales had good openings. Tales will be again very frontloaded but limited edition will increase first week sales. Smash will show good holds but 100k+ weeks will be past if they aren't already from week 2. 2 weeks until release and both KH3 and RE2 remain low. Where are you getting this Metroid info from? Look up doctre81's YouTube channel, he leaked it, Eurogamer confirmed it. Namco's Singapore studio, whose devs were actually the star wars 1313 devs have been working on a metroid project since January 2017 for Switch (and ridge racer 8) recently it went back to Namco of Japan, which I thought I saw was for networking, but maybe if doctre81 is reading this, he will clarify. As I said, they worked on a 2D version of BOTW proof of concept for their chemistry engine, officially BOTW started 3D development in January 2013, all that work for the lighting engine that they did for wind walker HD and the chemistry engine and all the other things to do with BoTW's engine was already finished when BoTW went gold on February 3rd, 2017 (so actually only 49 months of development). A 3D Sequel Zelda game coming next year makes perfect sense (as next year marks up to 47? Months of development since BoTW finished) and is already hinted by KingZell. Just doing the math, I've been saying for over a year, a BoTW sequel in 2020 is likely, given the timeline they gave us at GDC in May 2017. It's common sense they won't have to recreate the engine or all the work that can be reused in a sequel. Can you post the Top 50 and Software total sales in the previous thread and ask sfortunato to update the first message? I’d like to have all threads updated for future checks. developed in the same manner as Skyward Sword, would’ve taken too long and have been too expensive to make. It would’ve suffered the same fate as The Last Guardian - so they realised that an open world style game would be actually be a lot more feasible to make; since they could abandon the traditional, handcrafted approach). I'm sure that BotW is the most expensive game Nintendo ever made. Good opening number wise, or in terms of sell-through? Did we ever get any estimated of what retailers expect for either? Also in terms of numbers, what is "low"? I assume that just means that they won't be having a high initial shipment since they're not confident, right? Im really curious how the Tales split is going to be. PS4 will be more dominant for sure, but I think the Switch will get a good share of the sales too. Many games have low pre-orders and end with big initial shipment. Low or high is always relative to franchise. So low according to Kingdom Hearts 2 sales then ? I think the game sold 725k in Japan first week. Sure the game won't sale that much in 2019. The PS2 days are long gone now as you should know. How are the pre-orders compared to NSMB Deluxe ? That would be a better comparison to predict the actual sales. What does NSMBUDX have in common with KH3? 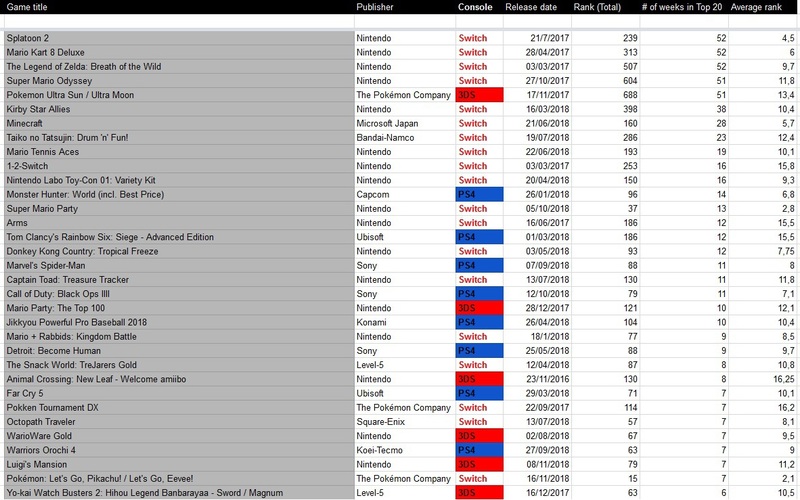 Like I said, to estimate KH3 first week sales based on pre-orders. Skyward Sword was previously the most expensive Nintendo game ever made, until BOTW came out. Open World environments are actually, generally, substantially cheaper to make than traditional handcrafted environments; making another traditional 3D Zelda game like Skyward Sword or Twilight Princess was actually considered unviable in HD (go watch the BOTW GDC Post-mortem video). Here’s the thing... ALL Zelda games are built directly on top of previous ones. Skyward Sword was built on top of Twilight Princess’s engine, which was built on top of Wind Waker’s engine, which was built on top of Majora’s Mask’s engine, which was built on top of Ocarina of Time’s engine (and going further down the rabbit hole; OoT was built on top of SM64, which was built on top of Starfox 2, which was built on top of Starfox 1). BOTW itself was also heavily based on the Xenoblade X engine too (its map is also conveniently almost exactly the same size). BOTW itself was also heavily based on the Xenoblade X engine too (its map is also conveniently almost exactly the same size). don't think that's true? BOTW came out just two years after X. There are way too many assumptions and unproven facts in this post. For one thing I've watched the GDC talk, and never did they say or even implied that they chose to go open world because it was easier or faster to develop. Nintendo reuse parts of their game tech across different games all of the time. Small example? The head/ eye tilt character object focus tech (where the playable characters head and eyes will automatically point to an object of interest to give a hint to the player). Ever since it was introduced in Wind Waker, ALL EAD/EPD games have used it since; even non-Zelda ones. Likewise, BOTW borrows Xenoblade X’s asset streaming tech. I'm not convinced. the hardest part about making a new Zelda game was always its construction and game/level design. cost never was an issue with a Nintendo game when its related to game design, they cut corners elsewhere (movies/voice acting etc). they didn't make it this way because it was easier, Fujibayashi said the game was extremely difficult to make. making an open world game is where the biggest companies now and best developers compete against themselves, and this is because its a bigger achievement, not less. it is always money. SS didn't sell like they wanted, so they probably decided to soft-reboot the series internally, they decided to embrace modern game trends and took a hard look at games like Skyrim/Assassin's Creed/Minecraft and others. they also had a lot of input from Monolith. It was in development at the same time as Xenoblade X. Shares many of the same staff on both games too. It is almost certainly sharing the same world streaming/loading tech. Feels like it's getting a bit off topic, but Zelda Wii U was shown off with gameplay in 2014, a full year before it was finished. Does Doctre81 have real info or is he making educated guesses? It's a genuine question. If the game really entered full development 2 years ago, it's definitely not planned for 2019 like I still hoped it would. Monolith Soft assisted Nintendo to do BOTW, notably on the big open world. It’s not using the same engine wholesale (obviously), just the asset streaming tech. That’s not an insult or a knock against BOTW, that is actually the sensible thing to do! The same people worked on both games, why throw away everything for no good reason? Anyway, the point is that the idea of using the “same engine” to pump out a sequel to BOTW, of any sort of remotely similar scale, within just 2-3 years is complete baloney. That is impossible. Hence, there is a place in the Switch’s lineup for a smaller scale Zelda game (ALA ALBW) in the interim. Waiting another 5-6 years for a new BOTW scale game is not realistic; it would never be able to release on the current Switch. no. it's absolutely not the same engine. only other game that share the xenoblade x engine is xenoblade 2. With a release in late 2020 it would be more like a development time of 3-4 years and that's not impossible. We don't know if it's in similar scale. It could be a bit smaller and more focused on narrative for example. An iterative sequel to BotW that build on this game’s strengths and addresses it’s weaknesses is something I now desire more than anything else on Switch. Edit: Thought this was Nintendo’s first party thread for a minute. Monolith’s assistance does not automatically entail that they borrowed X’s content wholesale and reskinned it. They had talent previously versed in the production of this genre so they are there to help. Monolithsoft also co-developed Skyward Sword FWIW. And also helped in things like A Link Between Worlds, Splatoon, Pikmin and Animal Crossing. Are there any notable variances between the MC results we get each month and corresponding LTD that ends up being substantially different from the official numbers Sony, Nintendo ever release? Like I see variances with Famitsu and MC, so I wonder how close these numbers are to the 'official' numbers, if we ever get to see them at the end of a FY. That was Monolith Soft. Kyoto (pretty sure Skyward Sword also was). When publishers share actual sell-through data, it's always based on trackers data (+ whatever digital sales). Nintendo uses Media Create for example. Monolithsoft Kyoto didn't exist when Skyward Sword was in development. His source is LinkedIn, and Eurogamer backed his info about a metroid game being developed by Namco's Singapore studio (same one behind star wars 1313) they even updated the info with Namco Japan being handed primary development. Oh my god I loved this game on iOS! I hope it gets an English release on Switch... Eventually. - Nintendo Switch - Hardware: 3.63 million units (+9.6%), Software: 13.41 million units (+84.3%). - PlayStation - Hardware: 1.75 million units (-2.4%), Software: 10.54 million units (+4.9%). - Nintendo 3DS - Hardware= 570 000 units (- 66.5%) , Software: 2.99 million units sold (-84.3%). Just noticed that Media Create not only posted Week 1 data with Week 52 report on their JP page despite claiming it's Week 52 data, but they actually have correct data (Week 1) on their English site. Someone was really confused about which set of data was supposed to go live on the website today, it seems (sadly, they weren't confused about whether full Top 50 data was meant to go live too, like last time :P). They co-developed Breath of the Wild. They most probably created the Zelda open world engine from scratch for Nintendo based of their own engine. Around 50 to 60% (around 50 to 60 people) of their development team were dedicated to Zelda according to the director while only 40 people were working on Chronicles 2. That's a lot of people just to create a few assets or what not. As expected, lots of Switch at the top. Some PS4 games tried to put up a fight at least.Splatoon 2, Mario Kart 8 Deluxe and Zelda BOTW all charted every single week this year. Super Mario Odyssey and USUM almost did, but ended up missing just one week. That's a lot of people just to create a few assets or what not. Breath of the Wild and Xenoblade X used different engines. What they have in common is sacrificing overall story and making the world itself the main focused. It's a good legit exercise. Kinda hope it find bigger success. All of the programmers come from Nintendo's side. The lead programmer Takuhiro Dohta talked at GDC and CESSA about EPD's lighting, physics, and AI engine. Monolith is one of two main assistants on the game. Then there were a bunch of additional sub-contractors.